A cannabis campaigner has said he wants to reopen a cafe for the plant's medicinal use in north Wales. Jeff Ditchfield was prosecuted twice when he ran the Beggar's Belief cafe in Rhyl for five years until 2007. But with MPs about to debate a Bill to legalise cannabis as a medicine, he is calling on police to allow a premises where people in pain can use it freely. North Wales Police said cannabis remains a Schedule 1 drug and it would have to enforce the law. Jeff Ditchfield said his organisation, Bud Buddies, has continued clandestinely to supply cannabis to people who use it for pain relief. He said it had grown from covering north Wales to a UK-wide network of people who grow cannabis plants which are then processed into cannabis oil and supplied free of charge. He told BBC Radio Wales's Eye on Wales: "I do not see why people who are medicating with cannabis should be a priority for North Wales Police or indeed any police force. "I see any resources that the police use to enforce the Misuse of Drugs Act and the prohibition of cannabis to be a complete waste of tax payers' money. "I've seen very good comments from the Police and Crime Commissioner for North Wales, Arfon Jones. "I would like to work with him so that I could open a medical centre here in north Wales, to assist people who are seriously ill, and people who are dying, without having to worry every morning, are the police coming today - will they kick our door in?" Mr Ditchfield was at the Commons when Newport West MP Paul Flynn tabled a Bill calling for cannabis to be rescheduled to allow it to be prescribed by doctors. The Bill has a Second Reading in February and Mr Flynn has been wished luck by the leader of the House of Commons, Andrea Leadsom. 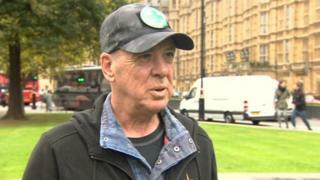 Arfon Jones, who was also at the Commons for Mr Flynn's Bill reading, has called for the legalisation of cannabis for recreational as well as medicinal use. He said he would not rule out a "medical centre" as proposed by Mr Ditchfield. "I'm fairly relaxed with the idea but it would mean considerable consultation with the local authority, the chief constable and the health board. So it's early days," he said. "I think the culture is changed and as long as we can evidence that people do benefit from medicinal cannabis I think we're going to get there." You can hear more on this story on Eye on Wales, on BBC Radio Wales, at 18:30 BST on Sunday 22 October. Should we be worried about cannabis in Wales?